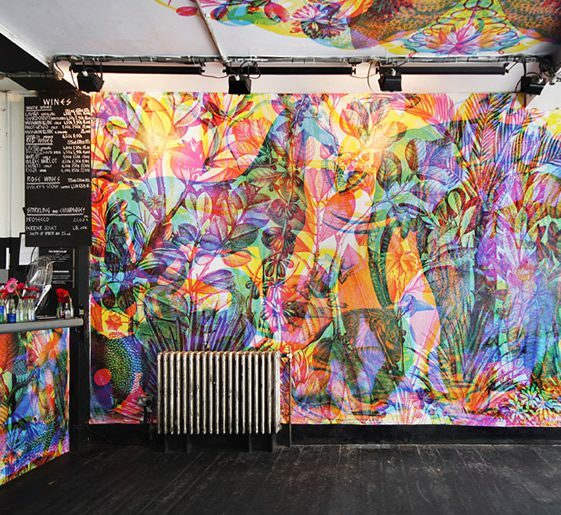 Milan based duo Carnovsky, who you may recall we introduced you to at the tail end of last year, opened their latest show – ‘La Selva: RGB Black Series’ – recently at DreamBagsJaguarShoes in the heart of London’s east end. 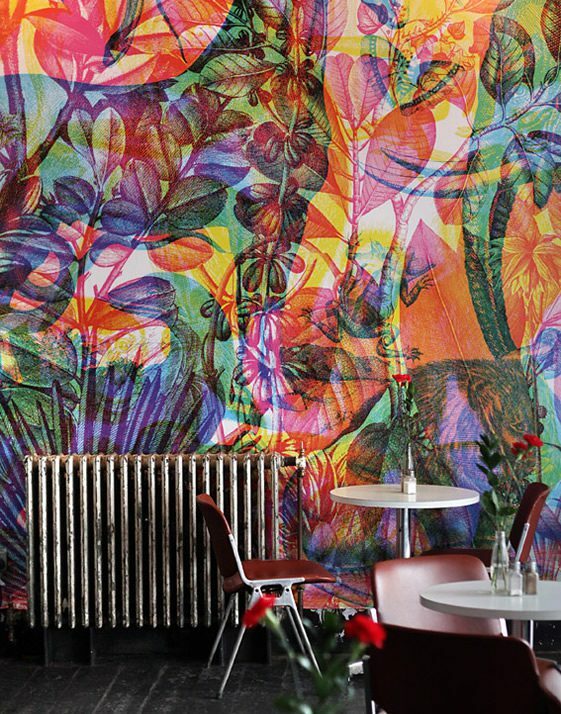 After the success of last year’s RGB wallpaper installations in Milan, they’re back with their new ‘Black Series’, where graphic Jungle surfaces appear to mutate and interact under different chromatic stimulus (in this case lights). 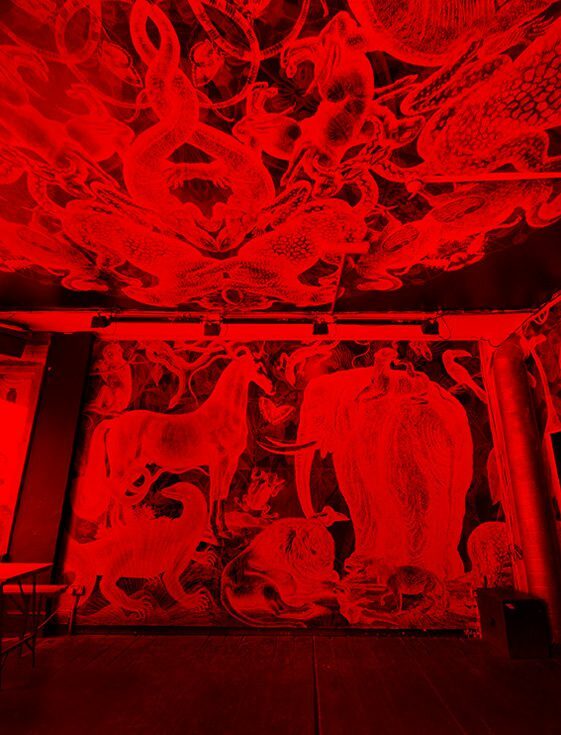 Expect exuberant, colourful and dense foliage with animals transforming on the walls, ceilings and bar of the popular Shoreditch watering hole. AM. What is the Black Series all about? C. RGB Black is a new RGB series available for now in wallpaper and some limited edition prints. They follow the same RGB principles but the colours are inverted so the background is black instead of white and through the coloured filters the images appear in negative. Some images are available in both versions, others just in one, it depends on the image, not all of them work in both. AM. You left out some of the anatomical human forms in this installation why is that? C. When we have the occasion of doing an exhibition or an installation, we try to present something new. 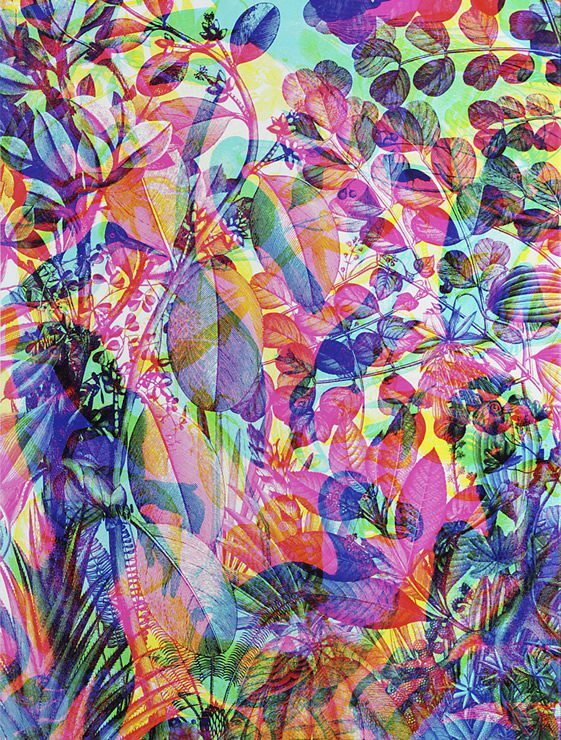 We were working on two things: the Black series and some new prints about the jungle theme and for this reason we decided to put both together and make an installation completely based on the jungle and the tropical forest dividing it in two parts: the day and the night. The Vesalio (the anatomical images) is one of our favorite series and we are working on it for an other occasion. AM. People often confuse the RGB installation with projection, I find this wonderful, the simplicity of the the RGB project with layered graphic illustrations that appear to be animated… is your artful trickery on purpose? C. Yes it is true, sometimes at the beginning people think that they are projections, and this somehow is something that makes the effect even more magical. Sure with RGB we tried to make something that was also spectacular, that could create an ambient in movement but in an unconventional way: a sort of animated wall. AM. This projects is on a fairly large scale… Could you see yourself doing something even bigger, perhaps buildings or bridges or towers? C. Yes, we like to work on different scales from small to large, and the nice thing about wallpapers is the fact that they allow us to achieve an architectonic scale, and besides we have always considered them more as contemporary frescoes than true wallpapers. In general with some RGB designs we think that the bigger they are, the better they work, because the figures become gigantic and it is possible to see all the details and textures richness, that on a small scale could get lost. Therefore if there is the possibility of doing something really big as a building, yes absolutely!!! It could be fantastic. AM. You must get this A LOT but we would love to know what inspires you to create? C. As always this is the most difficult question to answer. We have a lot of influences, not necessarily connected to the visual arts or design: lots of literature, cinema and music. We can tell you for example that our love for the jungle or the tropical forest does not come from the fact of have been actually there, but most of all from Kipling stories, Henri Rousseau paintings, and from Werner Herzog’ films (and life)… between other things. AM. Can you elaborate, what’s your favourite Kipling story. C. For sure it’s the Jungle Books because they are magical! More than the story about a boy that grows in the jungle, that is far far away from Disney’s version, it is the jungle itself what we find irresistible. The merciless law of the jungle, the complex hierarchies between animals and nature that have to be respected in order to maintain an equilibrium. In particular we love two stories “Kaa’s Hunting” and “How Fear Came”. AM. What about Henri Rousseau – favourite painting? C. In fact there are many. All the paintings he did about the Jungle or the exotic landscapes are so powerful. We can’t really choose one in particular: actually you can see there are many variations on the same subject. We think in this case the whole series is much more important than the single painting. AM. What is it about Werner Herzog that you find so interesting? C. Herzog is one of our favourite filmmakers: we consider him probably one of the few last heros of our age. It is impossible to see one of his films or documentaries without having in mind how it has been done. When Fitzcarraldo’s ship is dragged over a mountain, it’s such a powerful image that makes you feel like you could do anything if you really wanted to. When the ship is really dragged, we think that no special effect could ever give you this sensation of greatness, it is the author behind the character that’s the real hero. We also love his vision of nature, again merciless, cruel, egoist, but magnificent. AM. Wow… So what’s next for Carnovsky? C. RGB is for us a big world that we would like to explore more in depth. So we are working on new prints and applications. For now we don’t want to make too much anticipation about it, but crossing fingers, we hope to present something really nice during the next Milan design week. AM. And where can we get out hands on the RGB prints? 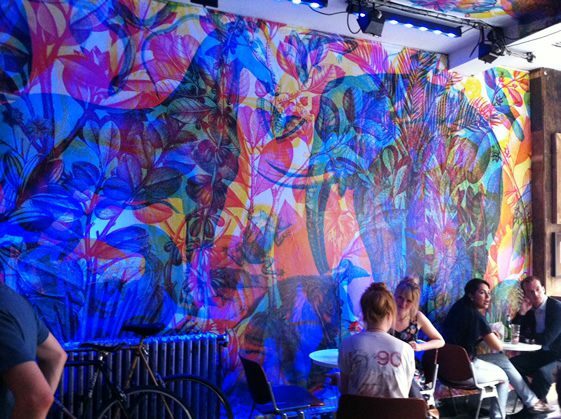 If you can make it to DreamBagsJaguarShoes, Carnovsky‘s installation is more than worth a look. I’d recommend you go at night, grabbing a quick beer of course, and be sure to watch the bar from the bustling street, you can see the frescos change from across the road. The installation is truly spectacular – the duo have captured the essence of the jungle and placed it in the heart of the city.